Even young children can enjoy the art of sand candle making. Sand candle making can be a fun and rewarding project for crafters who wish to learn more about making homemade candles. Even if you're new to the art of candle making, you've probably seen sand candles for sale at specialty boutiques and gift shops. These candles look similar to ordinary candles, but they have an outer shell made of plain or colored sand. They are available in a number of different sizes, colors, and scents. Sand candles are a popular element of beach-themed home décor and are great crafts for children to make with adult supervision. They can be given as thoughtful gifts for birthdays, Christmas, or other special holidays. 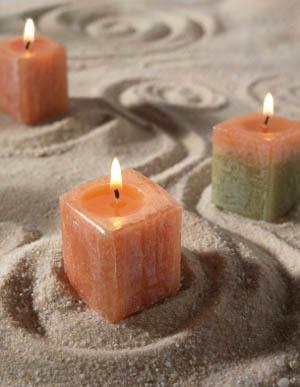 Enterprising crafters may even choose to use sand candles as the basis of a small candle making business. One Stop Candle Making Supplies has craft sand in a number of colors, as well as all of the basic supplies needed for making homemade candles. Bitter Creek Candle Supply sells candle wax, fragrances, dyes, and 17 colors of craft sand for sand candle making. Melt the candle wax using a double boiler or an old tin can placed in a pot of water. Add dye or fragrance if applicable. Pour about five inches of sand into a large plastic tub. The sand should be damp, but not excessively moist. Make a bowl shaped impression in the sand. For a more uniform-looking candle, use on old glass jar as a guide. Bury the wick bottom in the sand. Pour hot wax into the sand, making sure the wick remains straight. Remove candle and gently rub off excess sand. If you love the look of sand candles, but are short on time, you can achieve a similar look using purchased pillar or votive candles and spray adhesive. Hold the candle by the wick. Apply spray adhesive all around the candle. Roll the candle gently into the sand until all sides are completely covered.